Hanging in the back of the Kirby Center’s Van Andel Room is a small painting of George Wash­ington and James Madison by retired Hillsdale College art pro­fessor Sam Knecht. They stand in the halls of the Philadelphia state house, the first to arrive at the Con­sti­tu­tional Con­vention. Madison’s five-foot, four-inch frame stands in stark con­trast to Washington’s height of at least six-feet, three-inches, but Madison proved to be the true tow­ering figure during the con­vention. Across the room from this por­trait is another Knecht painting, this one of the signing of the Con­sti­tution. Madison and Wash­ington once again are the focal point, both poised to add their names to our founding doc­ument. Wash­ington is already honored on Hillsdale College’s Liberty Walk. He stands in front of Mossey Hall, seem­ingly poised to cross the Delaware River and take on the British. Missing, however, is a mon­ument to James Madison. 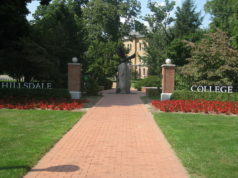 As an insti­tution that reveres the Con­sti­tution, Hillsdale College should honor the Father of the Con­sti­tution by making him the next statue on the Liberty Walk or by placing him in a prominent position at Hillsdale College’s Kirby Center in D.C.
Madison played a key role in the founding of our nation. He was instru­mental in orga­nizing a con­vention of the states to reform the Articles of Con­fed­er­ation, and he con­vinced George Wash­ington to attend the Con­sti­tu­tional Con­vention. 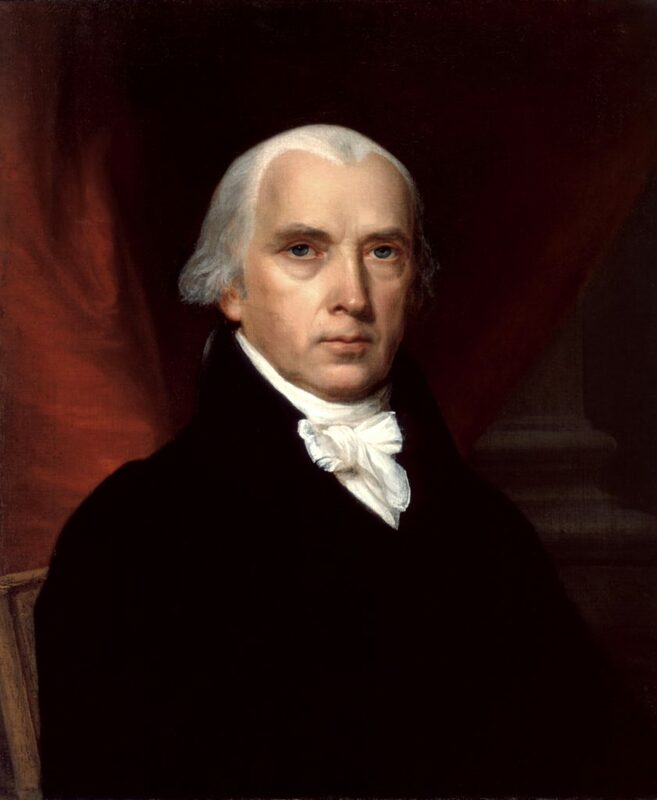 According to history and pol­itics pro­fessor Paul Rahe, “If James Madison is some­times called ‘the father of the Con­sti­tution,’ it is because he played a prominent role in sum­moning it and because, with the help of his fellow Vir­ginians, he pro­vided it with an agenda.” Madison was the del­egate to present the Vir­ginia Plan, a plan that laid out the American system of checks and bal­ances, an inde­pendent judi­ciary, a bicameral leg­is­lature, and pro­por­tional rep­re­sen­tation. Though a shy and quiet man, he spoke more than 200 times throughout the con­vention. Much of what we know about the convention’s debates today come from Madison’s notes. Larry Arnn, Pres­ident of Hillsdale College said, “Madison was a small man, eco­nomical in his move­ments. He rea­soned as he moved, pre­cisely. Also, his writing could soar. He was not showy, but he was driven by deter­mi­nation as fierce as quiet. If there was a book needing to be read, a letter to be written, a con­ver­sation to be had to produce a better Con­sti­tution, he was ener­getic and con­stant. 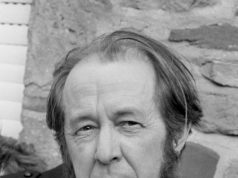 His writings explain the heart of the Con­sti­tution with sur­passing insight. He is justly remem­bered as the father of the greatest fun­da­mental law ever written and adopted.” After the con­vention, Madison teamed up with Alexander Hamilton to launch a national cam­paign for the Constitution’s rat­i­fi­cation. Under the pen name Publius, he, Hamilton, and John Jay wrote essays that were pub­lished in news­papers throughout the states. These essays are now known as the Fed­er­alist Papers. They have have been used ever since their pub­li­cation as an author­i­tative source on how to interpret the Con­sti­tution according to its original intent. An oppo­sition group known as the Anti-Fed­er­alists had launched an aggressive cam­paign against it. 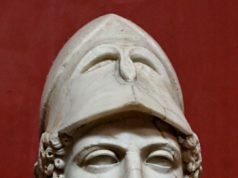 They claimed that the Con­sti­tution tended towards cen­tral­ization which would lead to tyranny — some­thing the American people had just fought a long war to escape. Without the Fed­er­alist Papers, it is likely the Con­sti­tution would not have been rat­ified. Madison was a political leader as well as a philosopher, a man of thought and of action. In 1789, Madison was elected to the House of Rep­re­sen­ta­tives. He then authored the Bill of Rights and ensured that it became law. Despite his reser­va­tions about the bill of rights — one of America’s most prized and enduring political doc­ument, respon­sible for pro­tecting the indi­vidual rights of Amer­icans against ever-expanding gov­ernment inter­vention — Madison helped bring it to life. Because of Madison’s work, America is the freest nation that has ever existed. Madison’s con­tri­bu­tions to American political thought are second to none. Throughout his life he demon­strated pru­dence and virtue as a statesman. There is no better way for Hillsdale College to honor the Con­sti­tution than to choose James Madison as its next statue on the Liberty Walk. This will not only be a mon­ument to Madison, but to the doc­u­ments that have shaped American political thought — the Con­sti­tution, the Fed­er­alist Papers, and the Bill of Rights. Krystina Skurk is a graduate student at the Van Andel Graduate School of States­manship. not a great argument. I have no qualms with any point that he made, but the essay utterly fails to name any names in the running and why this would be a better choice than those. I think an argument could be made that someone like Thomas Paine is pos­sibly better. Nothing here men­tions this com­par­ative element. Since the name is known, but not at the same level as even Hamilton (men­tioned) nationally, and basi­cally unknown inter­na­tionally, I think that this point should have been addressed.